Talk about making a girl’s day weekend weekl! Thank you everyone for the warm wishes! I am truly having a wonderful time in my engagement thus far. Taking it Day by Day but OH lots of planning to be done! As for my knitting, it’s always a weird come down after such a huge FO. I have a few things on my needles at the moment and I just finished a Dolores Park Cowl (gotta love quick and easy knits)… and I’m starting to think cowl’s don’t look good on me??!! I’m using the Misti Alpaca Chunky so it’s more flopy than a normal wool would be but I love the softness against my skin. I do have a little ball left over so I could go back and add one to two more stitches per round to make it wider… but not sure if that helps? Perhaps I should go back and change up the pattern all together?? A feather and fan maybe? Otherwise I’m off to go camping this week! My very first time sleeping in a tent for more than just one night. My fiance(! still a new feeling to say that), his sister and her husband have made plans to stay at Ranchero Pines near Lake George. I can see lots of fun tubing, knitting and maybe brewery hopping in the near future as well as some fireworks! Either way those folks who are always up-to-date on Ravelry, knit blogs and Flickr… how do you do it?? I just can’t focus on all of it! haha! I raise my needles to you! Oh I think it looks cute (not to mention, super soft)! Have fun camping!! Love that cowl and congratulations on your big news! as for the knitblog debate, my blog is staying put. it is the reason why i got in to all the other things! so far, i have struck a balance with the blog, flickr, and ravelry… but it does take up a good deal of time. time I should probably be knitting! HOW DID I MISS THAT RING!!!?!?!?! MAZEL TOV! I’m so so happy for you! Congratulations!!! And I didn’t really mean to start a debate – just spouting off at the mouth again. love the cowl – they are the best stashbusters! blogs vs ravelry: it’s hard to keep up with both, but I try! 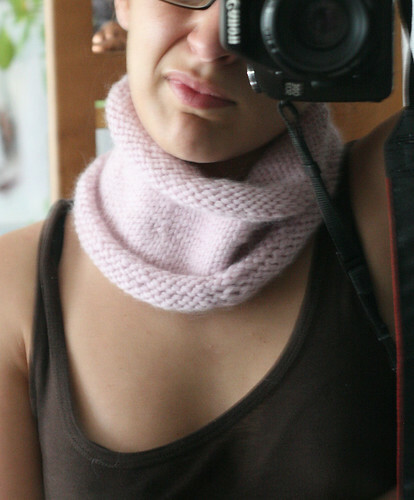 I think the cowl is lovely as is – in the simple stockinette it looks just soo soft! I too will continue to follow great blogs like this one and work on getting my own up to speed! Wait, you got engaged?!? What?? How do I miss these things? Of course, I can’t keep up online. I just do what I can and leave the rest alone. Congratulations!! And your Icarus=amazing, cowl=cute! That’s all. Have fun camping over the holiday weekend! Hola, dejame decirte que ingles no hablo pero no he podido resistirme a ver tu blog y todas tus cosas tan bonitas que haces, tienes unas manos maravillosas, que envidia de la buena me das!! !